As we all know Emirates Airline is one of the best airlines in the world. Everyone wants to join Emirates Airline as Cabin Crew. But we are very scared for the interview process. Because it’s not a simple process to clear it. so friends in today’s article I am writing on the Emirates Airline Cabin Crew Interview process step by step. Which help you to know better about the interview and also get prepared. I’m going to share the interview process that I have recently attended the Emirates recruitment event held in Malaysia. And here I will just write on my personal opinion. I have faced personally. I believe it will help those who are interested in joining Emirates Airline. 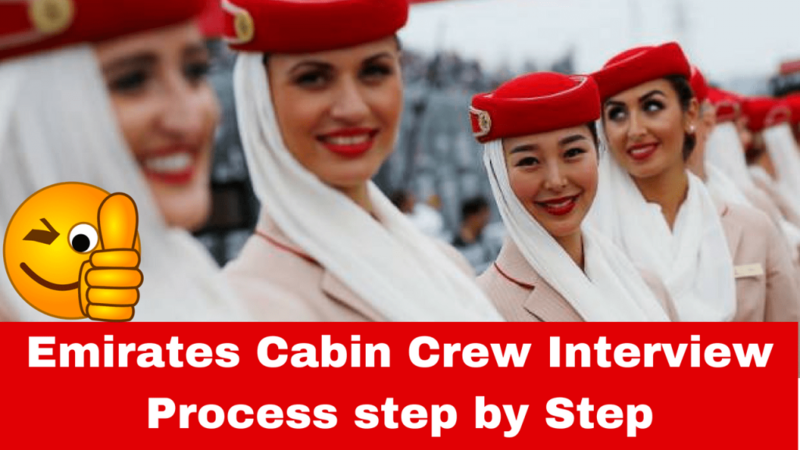 So, check out the cabin crew interview process step by step here. The first day of Emirates Cabin Crew Interview is a group discussion. It would be good to be prepared and ready since then, as everyone else, I had thought that I had to do the first day of the open day, send my CV, go home and wait for the call. The Emirates do not do this now and what they should do, stay behind and wait for the list of successful candidates to post on the wall. If this happens, then this group will run on the discussion forum. Make new friends around. I know that many of you want to be with your group, but why not just join new friends and meet? If you have been selected for the position of Emirates cabin crew, most of the time you will fly with different employees, so it is important that you have excellent social skills. I have gone through the interview with the Emirates for the seventh time and all the candidates I have seen have three common personality patterns: silent, suspicious and professional. Silent and suspicious are often the first people to arrive for Emirates Interview. They are very upset or they doubt their ability or both. It is compulsory to be a handsome/long candidate to participate in the recruitment ceremony. Yes, appearing in the model gives you a better return, but this does not guarantee you a job with the Emirates. While you look presentable, decent and professional; You are good to go. Finally, there are professional current cabin crew or have tried the emirate for trillion times (like me). Do not hesitate to contact them and you can get more information about life as a cabin crew. Check your makeup and talk with confidence. I think there is no need for further detail on make-up control because you know that it is so awesome if you smile happily in the interviewer with lipstick/snack teeth. – What is your date of birth? – What is your highest level of education? After answering them, you can say things … thanks for your time and enjoy your stay in ____. This helps keep them better and I feel that everyone loves humble people, is not it? Now, the step added on the first day – group discussion. Based on the number of people participating in the recruitment ceremony, the interviewer will divide everyone into some groups. You will be given a candidate number and wait for your turn to present the presentation. For my time, I was kept in the group of 5 and they explained to me the three good qualities found in _______ in 15 minutes and expand. Then the leader will randomly select the race for ______ and our group will have “astronomers”. If you do not understand what it means, then you can see your phone but make sure the interviewer has not paid attention (am I setting a bad example?). No, it is OK to check the dictionary and discuss it with your group partner. Be sure to ensure your presentation briefly and clearly because I remember that there was a girl who took more time in her presentation and was forced to finish it. Please avoid this special error and you may have gone to the next step. In this phase, you will see that many people have already ended. For some it would be amazing, but believe in yourself and have confidence; You are better than thinking 🙂 You will start the session by performing extended arm tests. For women, you can walk on Tipto without your high heel, but can’t reach 212 cm with dancers. For the gentlemen, footwear is not necessary to reach 212 cm. When they are talking, do not cut others off. At this stage, the interviewer will not interfere in his discussion because he wants to see how he interacts with other candidates. I think it is very difficult to keep our own showtimes at this stage because everyone wants the attention of the interviewers badly and what he does to shine and pay attention, he will do it. When you are talking, do not cut others off. At this stage, the interviewer will not interfere in his discussion because he wants to see how he interacts with other candidates. I think it is very difficult to maintain their own programs at this stage because everybody wants to do the attention of the interviewers badly and what it does to shine and pay attention, it will happen. It does not feel like a deflated balloon, but be sure to maintain good posture. I know that this is actually a long day and you are all tired of waiting and result in announcements. A small leaning sitting directly during the group discussion shows that you are observing and participating with the rest of the discussion. Suggested Method: Make sure you have some snacks and do not forget to drink water to stay hydrated. Appraisal day can be very long and tedious day. I think you have to use it because many Emirates flights are 13 to 18 hours long distance flights. There is a very famous teaching at the Emirates Aviation College: Listen to your body, eat whenever you want and relax enough. If you know how to take good care of yourself, I think that you are the perfect candidate for the work of the cabin crew :)After this stage, you will then move on to the English test. For the final interview, you will be given some dates to choose from according to your convenience and you will be given a final assembly form which you should be brought during the final round. You will also be asked to complete a psychometric test online. Three full-length photos (one formal in full body, one casual with full body & one casual with half body)eight passport size photos (all informal). Your highest level of education certificate ( I bring two because one of my education certificate able to prove my language ability. If your education certificate is in the native language, you may highlight it and translate it into English). This is a personal interview and the interviewer focuses better on you. For my time, I found two different interviewers who made my assessment day because my last interview was fixed after one month. So I was very worried before meeting my interviewer because we never met before. Tell me a time when you are stressed with work? How do you approach a distant colleague? Tell me a rule that you don’t like to follow but you still follow in work? Tell me a time when you solve a conflict? Tell me a time when someone disagrees with you? Why do you choose Emirates? The interviewer gave me a handwritten answer for my reference and I think it is necessary for him to inform the Human Resources Department of Dubai. After the interview, you will be allowed to ask questions. I have asked about a very famous question among all the candidates: There was an error in the submission of online application. Most of us are curious why this does not change, I believe that this was due to the recent update of the system on the Emirate’s website in 2017, but they ignored the status of the presentation and the result Waiting for 3 to 8 weeks. My interview lasted for about 30 minutes. The other friends who have gone through the previous interview are less than what I have heard. I do not know what this indicates, because I am still awaiting the result of my final interview. But do not worry, life is still going on. Just follow my daily routine because nothing will change if you are worried. Wish me luck! And I hope this article will help you understand better and give you a competitive edge since you are now familiar with the updated Emirates recruitment process for 2018. Before I end this article, I wish to encourage every FA wannabe to try Emirates interview as I have done my research online; Emirates intends to hire 11,000 people for the various job position in 2018 and guess what! It’s nice to share all these things, thanks for everything, I just want to ask you about maximum age limit as I’m 31 now so is it possible for me….